This is a liteloader mod for minecraft 1.9 and up based heavily on Urushibara's Biome Borders Mod. With it, you can toggle a visual border running along the edges of different biomes. The default key to toggle this effect is "B", but you can change that in the controls menu. This mod requires LiteLoader 1.9 or newer to run. Download it here. 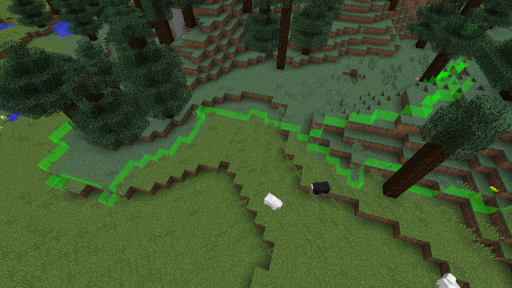 This is a fairly simple mod, and as the structure for checking biomes hasn't changed (and likely won't) it should only need minor fixes between major updates of Minecraft. All I've done with this mod was decompile it from 1.8, fix some of the code to match new versions of minecraft and recompile it -- the code behind it all belongs to Urushibara. If for some reason Urushibara returns and requests I take it down or requests development be transferred back, I will gladly comply, seeing as it wasn't my code to begin with. As of now, the 1.10 and 1.10.2 versions of the mod have been combined into one file listed for 1.10.2 that's compatible with both. Simply place it in your mods folder (not the versioned subfolder) to have it be loaded by either version of liteloader. If it's not working, run the liteloader installer again to get the latest version of liteloader for your current version of minecraft. Prior versions for 1.7.10 and 1.8 can be found on Urushibara's original post here.